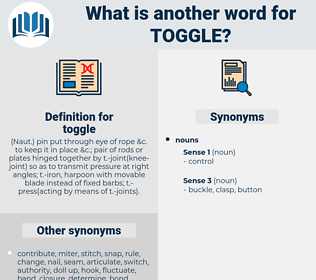 What is another word for toggle? ( Naut.) 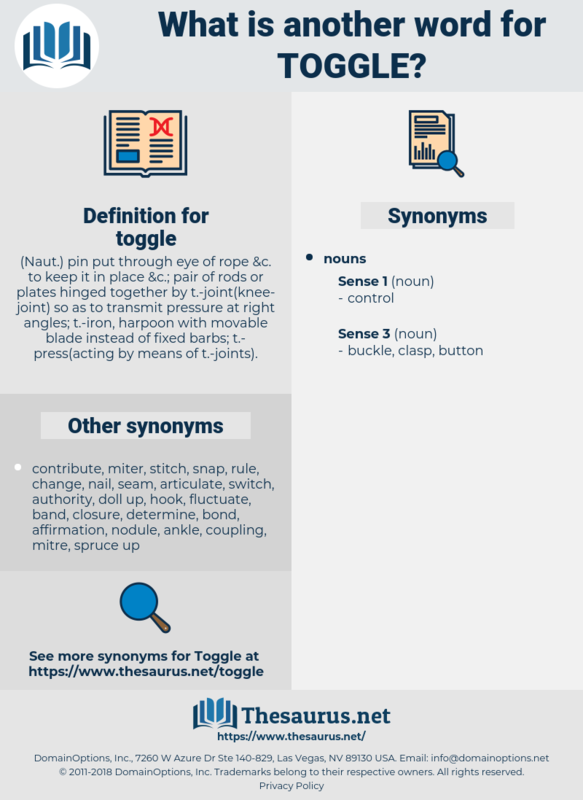 pin put through eye of rope &c. to keep it in place &c.; pair of rods or plates hinged together by t. -joint( knee-joint) so as to transmit pressure at right angles; t. -iron, harpoon with movable blade instead of fixed barbs; t. -press( acting by means of t. -joints). changes, commute, activate, enable, select. Getting a piece of wood from the deck, he made a toggle that would fit the staple, and put the scuttle in a convenient place. The writing was all over the plate like a biled dinner, and the English looked like it had been shook up in a bag, but it was signed with a nine fathom, toggle - jinted name that would give a pollparrot the lockjaw, and had the word " Count" on the bow of it. instruction, statement, command, program line. release, let go of, fasten, let go, fix, secure, relinquish.